I’ve owned this kit for several months, but not found the time to actually build it. I used several days of this year’s Christmas holiday to assemble the 3,208 pieces into a 124 cm-long model. Build quality was pretty impressive. It’s not Lego, and it goes for about one third of the price of the real thing: the pieces are not quite as nicely defined, and understandably lack the “Lego” logo on each stud. But most of the time I forgot I was working with a knock-off. I will definitely be buying and building more Star Wnrs kits: I have my eye on their Tantive IV Blockade Runner (especially if I can find a vendor who will supply it in the original box: most of them discard it, for some reason). I guess Star Wors was already taken. bwsd, that’s interesting. I must say I am much more inclined to be sympathetic to Jme Wheeler (who is an individual having his work generate revenue for others) than I am to the Lego corporation (which is big and has made exploitative price rises, and this year made 4.4 billion Kroner profit on revenue of 14.9 billion Kroner, for a profit margin of 30%). 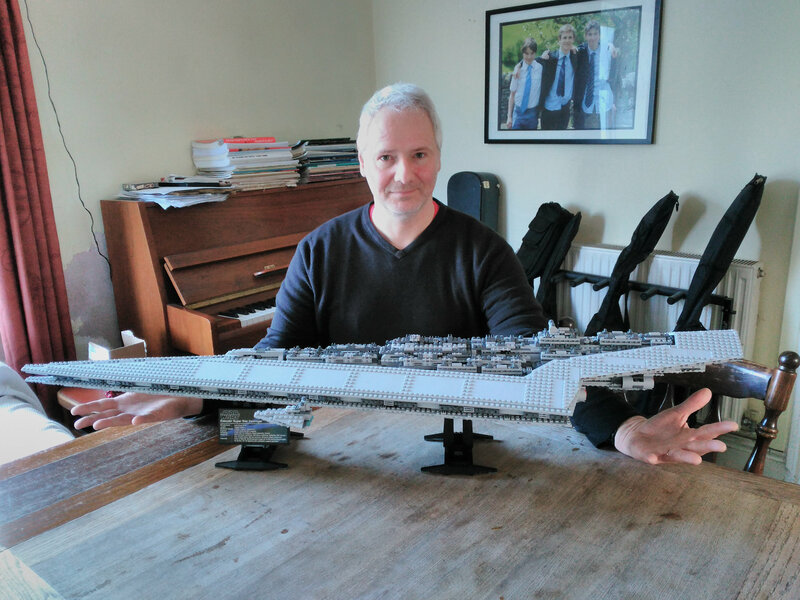 … which means that when you spend a frankly incredible £114.99 on a 75190 First Order Star Destroyer, £34 of that goes straight into shareholders’ pockets. I do agree Legos are an expensive habit (guilty) but how much of that is due to consumer demand vs. Star Wars licensing vs. exploitation? It comes down to a personal choice. As much as I would love to build the Millennium Falcon, I’m personally not willing to pay $800 USD for that experience. I also know I’m not willing to support Lepin who is able to undercut with their counterfeit Lego products because they don’t have to do the design and development that goes into creating new sets nor do they have to pay the licensing fees and/or royalties to Lucasfilm, Disney, Marvel, DC, etc. Again, a personal choice. I don’t fault anyone for buying Lepin sets. In fact, I’m jealous because they get to enjoy the build experience. But, I also consider myself a pseudo-collector and therefore only wish to buy and build authentic Lego sets. It’s clearly passing-off: it is dishonestly trading on goodwill built up over many years, at great effort and expense, by (several) other people, to sell a substandard product, with a high risk of consumers being misled into thinking it’s an officially approved product (or why the deliberately similar name?) and therefore directly damaging the official owners’ hard-won reputation when the buyer discovers that it is of inferior quality. They deserve to be sued into oblivion and I hope they are, quickly. I’m sorry, H, how could anyone think that a product called a ‘Lepin’ is Lego, or that ‘Star Wnrs’ is really Star Wars? Do you think consumers are so stupid that they’ll think that Lego made a typo on the box, or something? No, this is the free market in action. People dependent on government-enforced artificial scarcity (which is just what this is) tend to dislike it. But it means lower prices and more choice for consumers, and *gasp* a semblance of actual *competition* for Lego. No wonder Lego dislikes it. Your comment, Nix, is little more than deflection from the fact Lepin is openly stealing and profiting from Lego’s creativity, research, and development of a product as well as that of Lucasfilm, Disney, Marvel, and others. And while you rail against dependency on “government-enforced artificial scarcity” (I assume you’re referring to intellectual property and copyright protections), Lepin is dependent on a Chinese government that “looks the other way” on practices employed by Chinese companies to grow its own economy (increased employment and revenue). As I wrote previously, I’m not going to judge those who purchase Lepin products; I simply choose for myself to purchase Lego products to support further product development. But don’t pretend it’s anything but what it really is, counterfeit product produced from the fruits of others’ original and hard work without fair compensation. BTW, my wife and I went to the Lego store shortly before New Year’s where she surprised me with the NASA Apollo Saturn V kit (#21309). I walked out of the store feeling like a kid with that big, yellow bag. You can’t replicate that experience with Lepin. Do you think consumers are so stupid that they’ll think that Lego made a typo on the box, or something? Then why do they call it ‘Star Wnrs’ rather than, say, ‘Funky Space Adventures’? Is it not because one is more similar to ‘Star Wars’? They are deliberately trying to make their products look like someone else’s, in order to trade off their goodwill: goodwill that the fraudsters did not earn, have no right to, and could quite possibly damage with their inferior goods. That’s passing-off, and it is illegal and it is morally wrong. I’m pretty unconvinced by the “passing off” argument. Lego no longer has a monopoly on brick-based construction toys, as shown by Mega Bloks and other clones. The daring step that Lepin is taking is not just replicating the kind of thing that Lego is, but the specific kits. And that does make me a bit queasy for things that Lego still has in production. But here’s something: why do Lego sets go out of production? Every Lego kit ever made and sold has a parts list, and it would be trivial to set up an automated process to yank those parts and dump them in a bag along with a reprinted set of instructions whenever someone wanted to order something out of the back catalog (I assume this is pretty much what Lepin does). So supply has emerged to meet demand: Lepin is in part filling a market niche that The Lego Group could also fill, but has chosen not to. I assume that TLG hasn’t done this because their old products might compete with their new ones, and they might lose the rush of orders – many put in by scalpers – whenever a new hot set comes out. I suspect that creating artificial scarcity to drive up demand is part of TLG’s business strategy now, for at least some lines. I can’t think of any other reason that TLG would partner with NASA on some projects and then let “educational” kits like the Mars rover Curiosity sell out within mere weeks, with almost none of those kits reaching kids or teachers and almost all of them going to scalpers who turn around and sell them on eBay for multiples of the original asking price. Insofar as TLG is screwing customers by creating artificial scarcity to drive up buzz and demand, I don’t have much sympathy if some other company decides to screw them back by filling the niches they’re choosing to leave unfilled. If I buy a Lepin kit of something that Lego has let go out of production, Lego isn’t losing a dime, because my only other option would be to buy one in the used marketplace, and it’s not like Lego gets commission on those sales. I admit those arguments don’t apply to stuff that TLG still has in production. With all that said, I have one Lepin kit (of something Lego doesn’t offer) and the QC is not at Lego standards. Part of the premium you pay for with Lego is an essentially perfect quality control process, and the knowledge that the company stands behind its product (once, ever, I had a miscast piece, which I reported online, and TLG sent two perfect replacements gratis). But if Lepin offered a Mars rover, I’d be all over it, because TLG chose to let theirs sell out. You’re missing the (potentially huge) opportunity cost of having a whole complicated (possibly the most complicated, as it has to be able to fetch any arbitrary part at any time, rather than just having its supply chains set up for whatever set it is currently producing) machine sit idle most of the time, only to be active when someone orders an otherwise-unavailable set. That is to say, I suspect the real reason Lego kits go out of production is that their machines are super-optimised to be able to produce one kit incredibly quickly, in a way that wouldn’t be possible if they had to be able to switch from producing any arbitrary kit to any other arbitrary kit at a moment’s notice. Therefore the number of kits they can be producing at any one time is limited by the number of machines they have, and switching a machine from one kit to another is a big job. So, in the case of those NASA kits, they predict demand, set up the machine, run it for long enough to fulfil their expected demand, and then switch it over to some other kit. By the time it becomes clear they have underestimated demand, it is no longer economical for them to switch the machine back to producing the NASA kit (unless they underestimated it so badly that they would sell maybe thousands or tens of thousands more copies, which is probably what it would take to make it worth stopping production on the other kit that machine is presently doing and switching it back to the NASA one). It’s not some nefarious plan to keep prices high by introducing artificial scarcity; it’s simply the economic realities of massive-scale highly-optimised manufacturing. H, even if your more charitable interpretation of why Lego let their kits go out of production so quickly is correct, I don’t see that it negates Matt’s argument. Lego have chosen, for whatever reason, to vacate a segment of the market; Lepin are filling a demand that Lego refuse to. I’m struggling to find tears for Lego here. You don’t have to find tears for Lego to realise that what the scammers are doing is passing-off, is illegal, and is immoral. Well, that is what you have been asserting all along; but Matt has made what I consider a persuasive counter-argument. If you want to persuade me you’ll need to do more than re-assert your original claim. In summary (A) it’s not passing off, since it’s obviously not Lego; (B) it’s legality has yet to be determined; (C) its morality is open to interpretation, especially when it comes to sets the Lego simply doesn’t make any more. (a) Then why are the logos, names, designs, etc etc, all obviously deliberately similar? (b) Obviously the legality of anything has not been determined until a court has actually ruled (and I suppose technically not until the highest court has ruled as a lower court’s decision could always in theory be overturned) but are you really saying that this means nobody can ever say that such-and-such a thing is illegal until that specific case has been to court? (c) No, it isn’t, because to take advantage of, and trade off, someone else’s creativity and goodwill, which is what they are doing, is immoral. Nobody has a ‘right’ to any particular Lego set. They ship out entire LEPIN box whereas aliexpress send loose bricks. I thinks it’s no necessary to struggle to LEGO and LEPIN. LEGO is always LEGO and all other brands are plastic bricks. LEGO fans never buy LEPIN. And LEPIN is becoming to bring ther own MOC set or buy designs from other building blocks fans.